Comfy Hotel Reservation assists hotels, apartments, b&b accommodations, motels, guest-houses or holiday homes in managing and maintaining reservations. Hotels and travel agents can achieve maximum time efficiency and best costs in processing reservations. The system is fully scalable and designed to provide extensive flexibility and varied choices. Supports all versions of Microsoft Windows. ...... it is also possible to view multiple rooms simultaneously or open the reservations of several rooms at the same time. Comfy Hotel Reservation can maximize yield and minimize unsold room nights for hotels of any size and market orientation. Managing repeat customers and recording customer preferences helps you to retain your customers. All profiles data is protected with a password preventing unauthorized access. Comfy Hotel Reservation has the Auto Backup feature that allows saving the data to the secured archive. 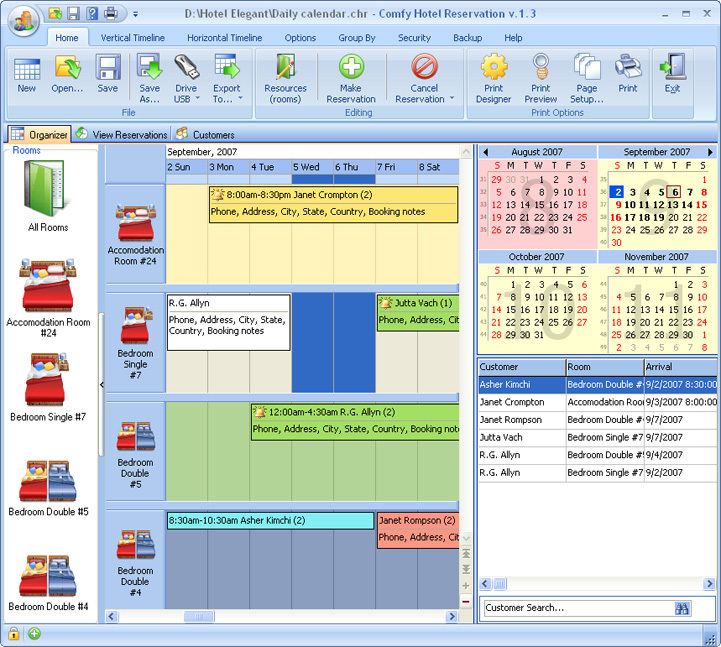 Comfy Hotel Reservation also has a built-in Print Designer, which offers a variety of original templates and options to make a fine and clear printout of a schedule. What is important, the data from Comfy Hotel Reservation can be exported to many different formats, like MS Outlook, XML, HTML, XLS and TXT. Supports all versions of Microsoft Windows. Photos slideshow. Tokio Hotel screensaver. Tokio Hotel Free Screensaver. Photos slideshow. Venice Hotels Toolbar for Firefox - Find and booking hotel in Venice, Italy. Qweas is providing links to Comfy Hotel Reservation 4.1 as a courtesy, and makes no representations regarding Comfy Hotel Reservation or any other applications or any information related thereto. Any questions, complaints or claims regarding this application Comfy Hotel Reservation 4.1 must be directed to the appropriate software vendor. You may click the publisher link of Comfy Hotel Reservation on the top of this page to get more details about the vendor.